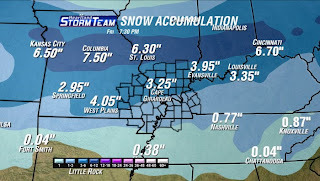 More of the NAM model is in and I am starting to get specific numbers for across the area. Cape Girardeau, Mo - 0.24"
St. Louis, Mo - 0.45"
All of the models are wanting to keep the snow to liquid ratio higher than usual. The general rule is 10:1. That can wildly vary depending on several things including the surface air temperature. The models are hinting at anywhere from a 13:1 to as much as 17:1 ratios. I have a hard time buying in to the 17:1 numbers. I think we could have anywhere from a 10:1 to a 14:1 ratio. Time to do a little math and break down the above liquid numbers even more. I'll put the ratios that I think are more realistic and I'll include the higher ratios where indicated by the models. Cape Girardeau, Mo - 0.24" | 2.4" | 3.3"
Evansville, In - 0.28" | 2.8" | 3.9" | 4.5"
Farmington, Mo - 0.23" | 2.3" | 3.2" | 3.9"
Jonesboro, Ar - 0.25" | 2.4" | 3.5" | 3.6"
Indianapolis, In - 0.15" | 1.5" | 2.1" | 2.9"
Paducah, Ky - 0.25" | 2.5" | 3" | 3.3"
St. Louis, Mo - 0.45 | 4.5" | 6.3" | 7.2"
The hi-res RPM model is also in. It is putting out some decent numbers on the latest run (0z). To be honest, the RPM has been bouncing around with the snow numbers with this storm. I still feel comfortable with my numbers previously mentioned. 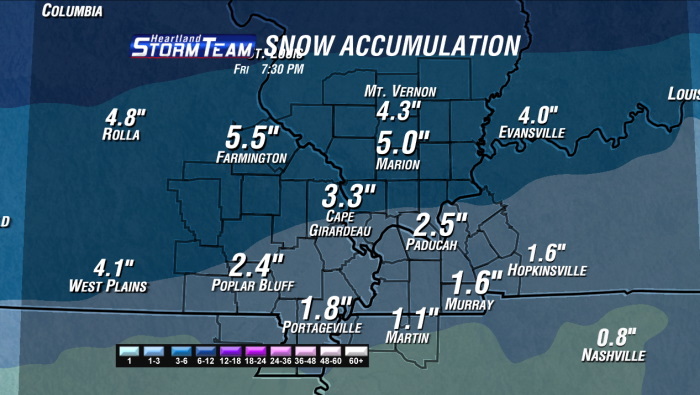 Generally 2" to 4" of snow across the area. Areas over the southern part of the KFVS viewing area might be a little below that and some of the northern counties of the KFVS viewing area could go up to 5" to 5.5". In central Indiana I think the heaviest amounts will be south of Indianapolis. Indy metro could see anywhere from 2" to 4". Further south towards Columbus and Bloomington I think there could be 3" to 6". I think there is going to be a narrow band of higher totals that stretches from Missouri through south central Illinois and through south central Indiana. The million dollar question... Where is the band going to set up? I don't know right now. For the most part I think the band will be north of the KFVS viewing area, but I wouldn't be shocked if the band clipped a little of our northern counties.